Since 1962, students across India celebrate Teachers Day every Sept. 5. Teachers Day began when a few students of Dr. Sarvepalli Radhakrishnan, India’s first vice-president and second president, suggested that they celebrate his birthday. He suggested that his students celebrate all teachers rather than just him on this day. For Indians, the day is an occasion to express their appreciation for teachers. It was originally just an Indian holiday but has now spread across the continent. It is, however, more prominently celebrated in Indian schools. Different schools have different ways of celebrating, including mimicries performed by the students for teachers, special lunches, and other treats. This year at Woodstock, the National Honor Society (NHS) organized various treats for teachers as a token of gratitude. 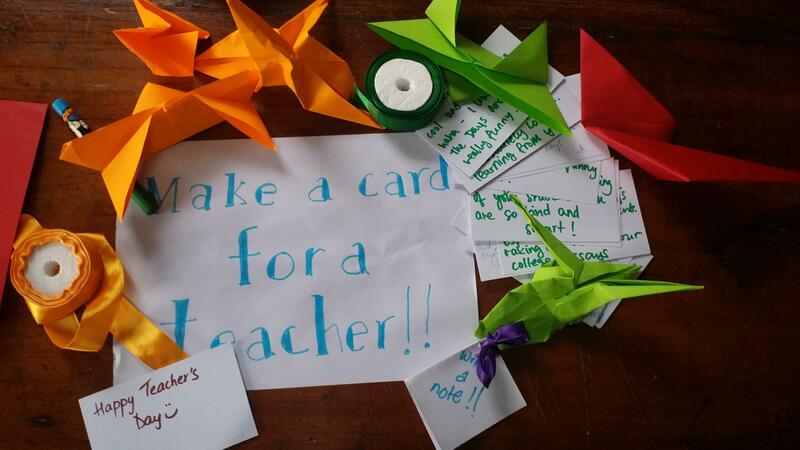 They gave roses, cookies, and origami notes to every teacher. For many teachers, this was a surprise as this was the first planned Teacher’s Day celebration at the school. For many people, this celebration of teachers was new and foreign. “I liked the surprise, I wasn’t expecting anything, and a rose on my desk in the morning was a pleasant surprise,” Dr. Robin Carter, science teacher, said. Teachers Day was a way for students to show their gratitude to the teachers, and many hope this celebration becomes a tradition at Woodstock in the coming years.